Charlotte is now 9 months old. 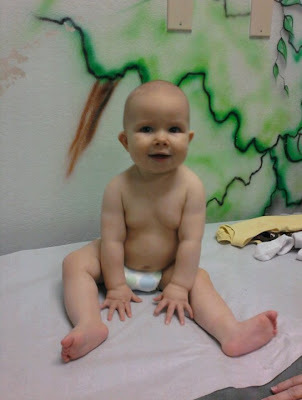 At her last doctor appointment she was 17 pounds 14 ounces and 28.5 inches long and very healthy. Hooray. She has had a number 0f milestones this month. My favorite of course being that she now says mamamama in addition to dadadada! Ok actually my favorite might be that she is sleeping so great most nights. She has slept through the night several times from her usual bedtime of 7:30pm to 5-6ish. Most nights though she still wakes up once but is quick about nursing and then heading right back down. But the craziest most life changing milestone is that Charlotte now crawls! Tiring but so fun! I have a video of this but we are having technical difficulties getting it uploaded. I will try again later. Her 9th month started off great celebrating Todd's first Fathers Day. We went out to dinner and also spent the day with the Davis Family. Charlotte also had her first 4th of July although we did nothing except dress her in a cute patriotic outfit. It was over 100 degrees here that day and the air is always thick with nasty fire cracker smoke. Hopefully next year will be better and we can take her to watch a real fireworks show. The best part of the month was the BEACH HOUSE!!!! It was such a great week and I loved being with Charlotte the whole time. She has pretty strong "stranger anxiety" so she was pretty attached to me but she warmed up to everyone and definitely loved being around them. I plan on doing a full post on the week...someday, but in the meantime here is Charlotte discovering sand! Can't wait to see you on Saturday!!!! We were lucky enough to have a beautiful cool spring this year (though summer has now come on with a bang) and Todd was able to get some great shots of Charlotte in our front yard. Now that Charlotte is almost 9 months I guess I should get around to writing about her 8th month. Charlotte is 8 months old and despite the lack of both hair and any teeth she seems to be learning new things everyday or at least mastering the things she kind of did by accident before. She now can roll without the huge effort that wore her out just flipping over once before. She hasn't quite figured out that this means she could actually get around the whole house easily (which we don't mind) but has started to roll a few feet out from where we put her. It does mean that she now rolls over to her stomach and back in her crib quite often. Once Todd and I got used to this and stopped overreacting and going in to flip her back over to her back (stomach sleeping for little babies is a major no-no that is drilled in to our heads at every turn) we realized not only is she fine sleeping on her stomach but it seems to help because...Charlotte now sleeps!!!!!!!! Not exactly through the night but she goes to sleep without any problems and usually only wakes up to eat once in the night which I can totally handle. It has been heaven. (Sneek peak to month 9...this has gotten even better! ) After waking up basically every hour during month 7 we knew something needed to change and after reading a couple sleep training books we implemented a few suggestions and it worked miraculously easily. A few tears but after just one night where she only cried for about 5-7 minutes she figured it out. Now that she sleeps so well she has plenty of energy for her absolute favorite thing to do which is stand up and walk with assistance. If we are anywhere near her she will grab each of our hands with her own and then insist that we brace her while she stands and then holding onto our hands she likes to walk the house. She is still wobbly of course but she is getting pretty good. I don't know how it's possible but we don't have any pictures of this. That is definitely a first. Other than that it is just play play play all the time...so many toys so little time! One last picture of my happy girl! That smile never gets old. We are now closer to the big birthday than we are to her actual day of birth which is just insane to me. It makes me excited and then feel like crying basically all in the same second. I wonder if I will ever do a monthly post and not start with saying how fast time has been going. I kind of think not. The cuteness factor is now in overload. Charlotte can now sit up on her own without tipping and just plays and plays and plays with her toys. Her favorite toy right now is the shape blocks and box that the Easter Bunny brought for her. The blocks are the perfect size for her little hands and one of them is always sticking them in her mouth. 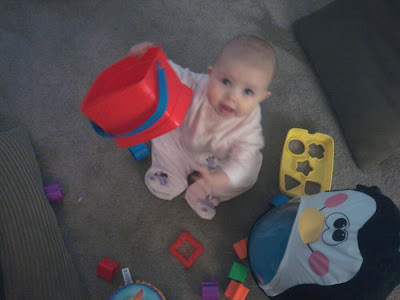 She likes to knock over the tower of blocks we build and she also will "bang" the blocks together with one in each hand. It is so cute. She also really likes her bouncer and is getting more into playing with the toys on it as well as bouncing. After our busy Easter weekend we have had a pretty low key month just hanging around in town which has been nice. I did have a wonderful lowkey first Mother's Day. We went out to dinner together the night before so we could avoid the crowds and long waits. On Mother's Day Todd and Charlotte got me cards, flowers, and tickets to go see Les Miserable in July. Can't wait! Visit charlottejoan.shutterfly.com for an excessive/obsessive amount of pictures.